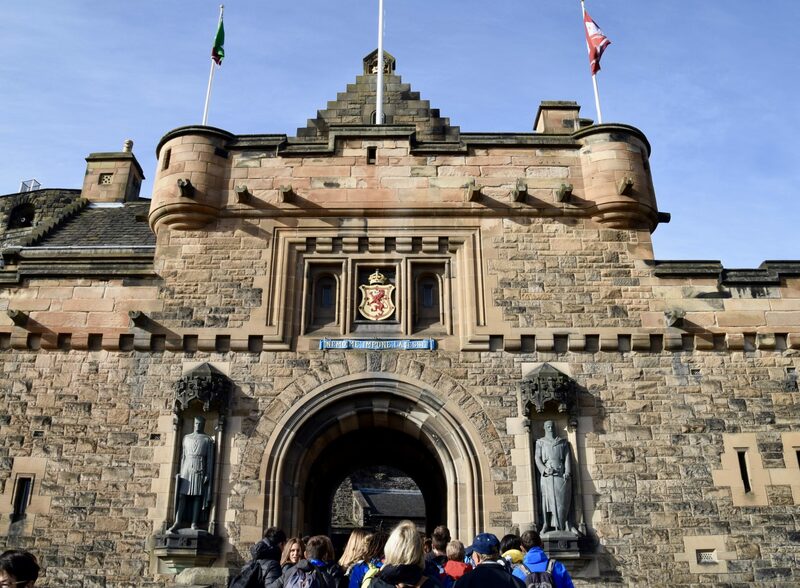 *This Is Edinburgh was kind to sponsor our experiences visiting the Royal Mile in Edinburgh, and we are so grateful for the opportunity to share it with you here. Whatever your age, the romance and history of Edinburgh can be felt in so many ways – none of which is stronger than the Royal Mile and Edinburgh’s 101 Objects. 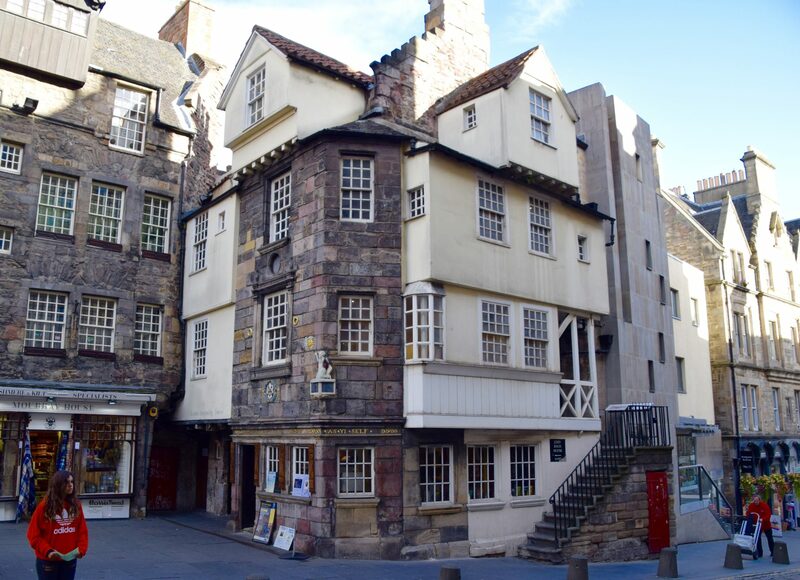 Named the Royal Mile because it connects a route along High Street from The Palace of Holyrood House to Edinburgh Castle, the Mile is dotted with 101 interesting sights worth seeing along its cobblestone streets. Even the stones in the streets and the buildings on either side are immensely historic and interesting from an architectural perspective. More interesting than it might seem, this building houses a series of mysterious and anonymous sculptures made entirely from the pages of books. They are miniature scenes, all painstakingly handcrafted from books into sculptures honoring great Edinburgh writers including Edwin Morgan, Robert Louis Stevenson (Treasure Island and Jeckyl and Hyde), Arthur Conan Doyle (Sherlock Holmes) and more. Inside the John Knox House stands the famous Geneva Bible, which Knox translated from Hebrew into English so it could be reproduced for the masses. Here in his home were hatched many royal plans and decrees. A learned man known among his peers for his wisdom, he lived a long and prosperous life in this house, which is furnished to represent his home as it appeared in the 1500’s. During Medieval times and the Black Plague, tenements built along High Street were crammed full of poor peasants from front to back. These buildings were often constructed very poorly and condensed tightly to stretch across entire city blocks, which made them perfect tinder for regular fires and other catastrophes. 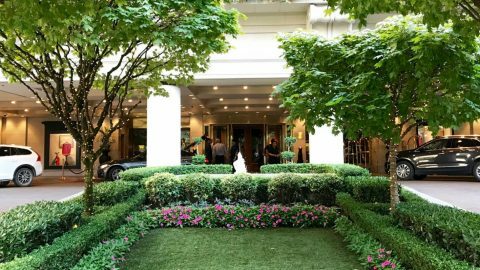 When city architects started to rebuild them with more modern structures, they created Closes or alleys which tuck in off the street and tunnel under buildings to open back patios and courtyards in the rear. Mary’s Close is one of many in the city, with this particular one made famous because it’s so well preserved and available for touring deep under the streets and buildings of the new City. 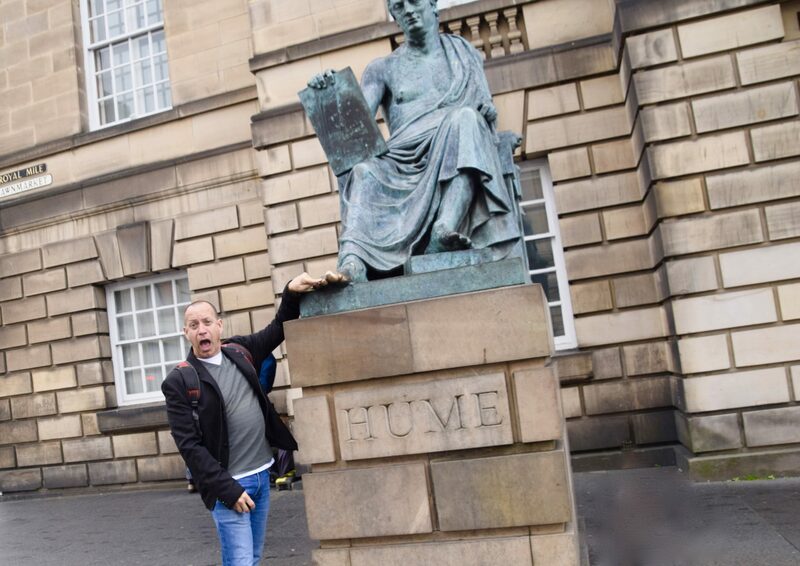 David Hume is famous for his writings in philosopy, and there are monuments in his honor throughout Scotland. But that’s not what makes this relatively new statue of him such a draw. It’s said by local students that it’s good luck to rub his left big toe before taking exams. Whether that is true or not, the evidence is clear when you view his shiny brass toe attached to a very weathered, greenish and not-at-all-shiny body. Hmmmmm. Well we had to do it too, just in case. Touch the toe! Touch the toe! This beautiful cathedral was built in the Gothic style around the year 1880, but has been a place of worship for more than 900 years. The Cathedral is crowned by a unique architectural trick that is lit at night to resemble an actual crown. The inside is even more spectacular, with very fine examples of stained glass windows and ceiling of particularly importance for its intricate carvings. 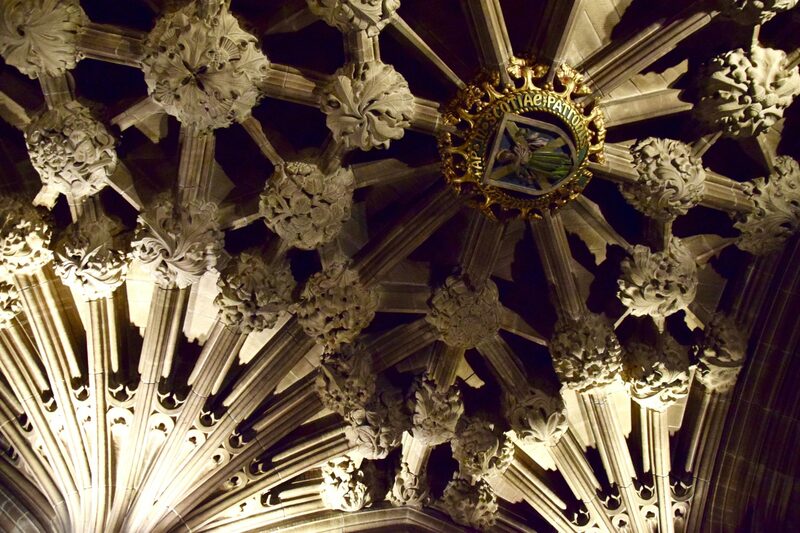 Of particular interest is the incredible ceiling carvings in The Thistle Chapel, just to the right at the front of the building. Outside along the sidewalk in front of the church sits a heart made from differently colored paving stones, signifying the site of a former prison. 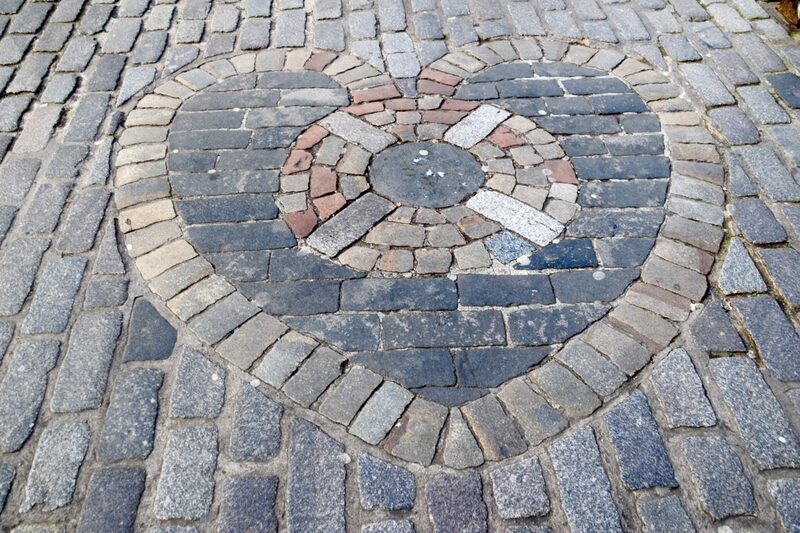 Positioned in the center of the city, the Heart of Midlothian draws much along the Royal Mile attention now – people spit on it for good luck! Don’t know why someone would want to spit on this nice heart! Known for its beauty and starkness atop the hill in Edinburgh and perched on a cliff of enormous stone, Edinburgh Castle is a bit intimidating and foreboding. We could imagine what it must have felt like for a visitor to ride up the gates on a horse, asking for admittance. The walls are thick stone, the entry ways are guarded by draw bridges and thick wooden doors with spikes on the bottom. A long cobblestone road windows slowly up the hill through several more protective archways before reaching the interior buildings inhabited by the royals. Yikes! Once inside though, the exhibitions are amazing. The Royal Jewels are not to be missed, with precious gems so large we almost can’t believe they are actually real. The dungeons are also a point of high interest, and have been recreated as though they were housing nearly 100 inmates, prisoners of war that were packed into these nasty dungeons to live out their days. We’re not sure it’s possible to visit all 101 Sights in one day, but we made a good effort. It would be so cool to come back and hit some more – it was hard to decide which ones to visit and which to skip when we planned our day, so I’m sure we missed some great stuff. 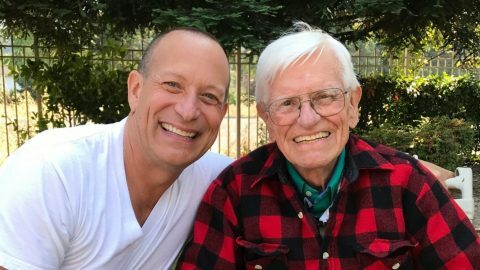 Have you hit any others on the list of 101? We’d love to hear what you loved (or didn’t) and what made your top picks! I love Edinburgh, but I wish we had had more time to explore. This post makes me realize I have to go back and see more things! It would be hard to hit all 101, but worth a try! Really cool. i love visiting places where history seems to be everywhere. I have wanted to visit Scotland for quite some time. Hopefully I’ll get there. I can’t wait to go back. So many things we didn’t have time to see. Haha yes there are so many things to see, I guess we will just have to go back! 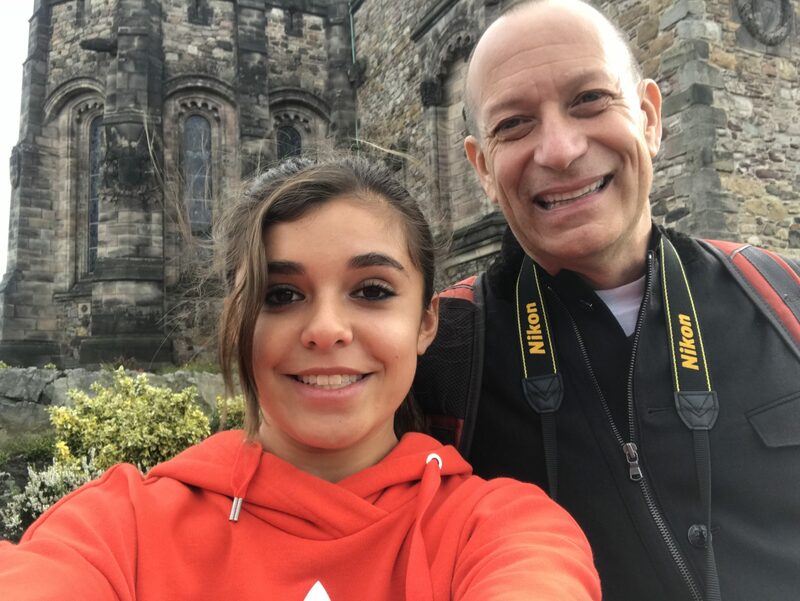 Ha ha, visiting 101 sights in a single day would be tough… But you made a good effort indeed 😉 Hope to visit Edinburg one day. Edinburgh continues to be one of my favorite cities in Europe – hope you can make it!